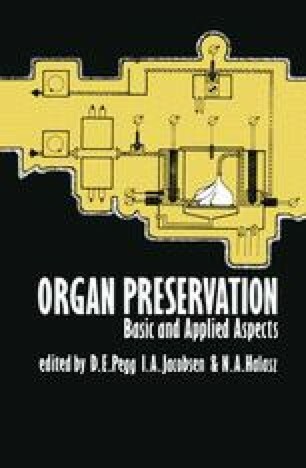 Currently, clinical preservation is at a standstill, the approximate maximum safe cold periods for kidneys, livers and hearts being 72, 10 1/2 and 3 1/2h, respectively; a tiny fraction of their in vivo lifespan1–3. Neither the exact nature of the limiting factors nor a method for circumventing them is at hand. It seems likely that inactivation of the sodium pump, depletion of respiratory chain nucleotides, cellular swelling and/or membrane injury result in deterioration of the organ over time1.